Wheels are supplied in every hub fitting and freehub combination. If Hope make the hubs, we will build the wheels. 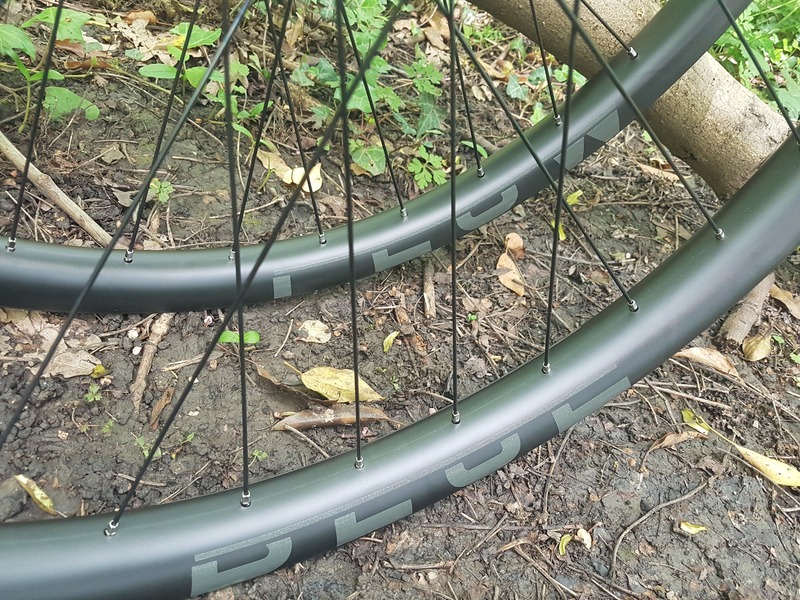 They are delivered tubeless ready with Stan’s rim tape fitted – all you need are tubeless valves and sealant and the your tyres will pop on and seal with ease. 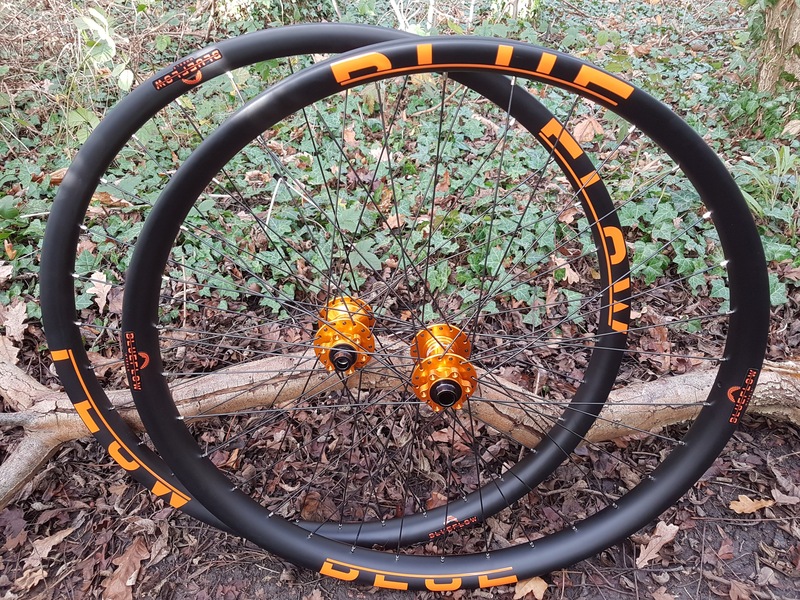 Choice of 6 colours of Hope Pro 4 hubs. 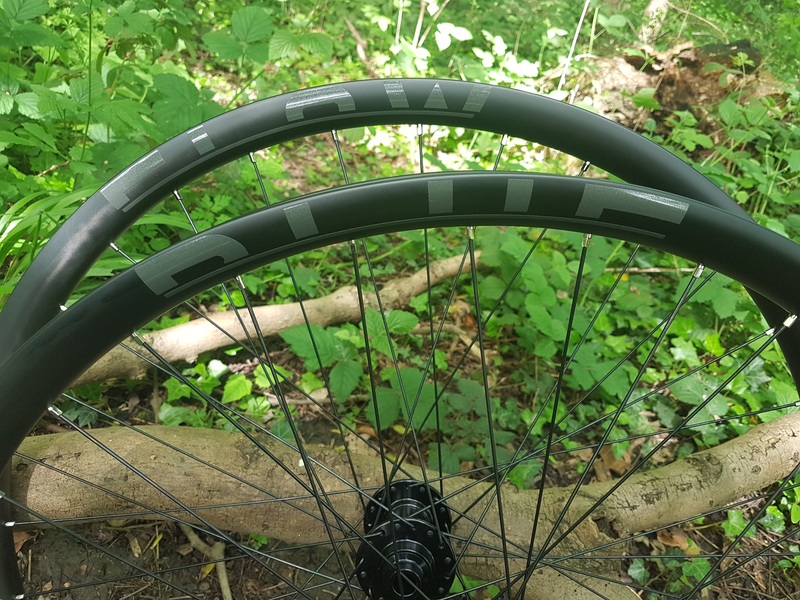 If you’re looking for wider rims without the weight penalty but with all the handling advantages carbon rims offer, these could be for you. They are 42mm wide externally with a 35mm internal width. Weighing around 1720g for a 27.5 wheelset with CX Ray spokes, they are a similiar weight to much narrower XC alloy rimmed wheels. These can be comfortably with tyres between 2.3 and 2.8 widths. They are asymmetric rims to give more even spoke tensions on each side of the wheel for an even stiffer stronger wheel. Rims are constructed from unidirectional Toray T700 carbon and have a hookless bead inner profile. They are asymmetric to give closer to equal spoke tensions on each side of the wheel for an even stiffer, stronger wheel. Like all of our wheels, they are built on Hope Pro 4 hubs in your choice of colour and available in all sizes including Boost and with either freehub arrangement. Choose any combination of rim decal colours to match your hubs and bike. 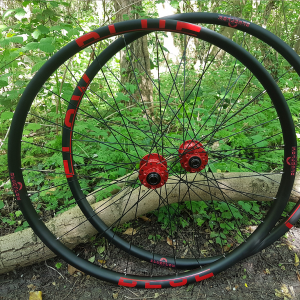 Standard wheels are built with Sapim Race 2.0-1.8-2.0 double butted spokes which are wider gauge than most competitors build with but are up to the job for the type of riding these wheels are built for and do not snap. If you would like the same strength at a lighter weight, choose Sapim CX Ray spokes for an approx. 90g per wheelset weight saving – the most expensive and fatigue resistant spokes on the market. We build these wheels with 32 spokes on the rear and 28 spokes in the front. Prices include free UK delivery and we deliver to most other European countries for a small extra cost. i bought a set of these wheels from Stuart and i couldn’t be happier with them. The wheels in the pics are the ones i ordered and they look even better in real life than they do in the pictures and the performance matches the looks. I had a pair of 30mm 29er wheels on the bike prior to swapping to these and haven’t gone back the 29ers yet. 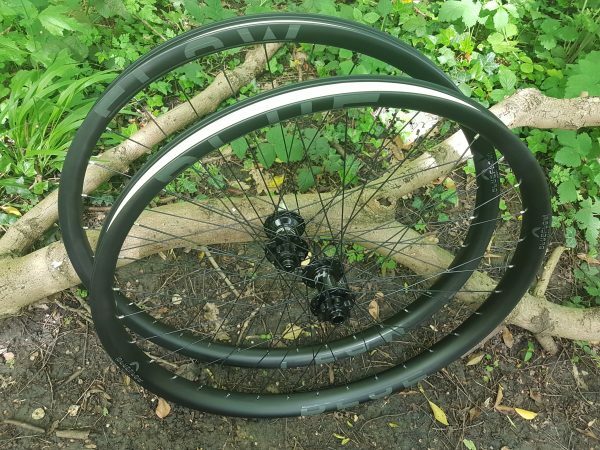 I am running them with 2.8 maxxis rekons which are setup tubeless (tubeless setup was easy with these wheels) and are working well for me. 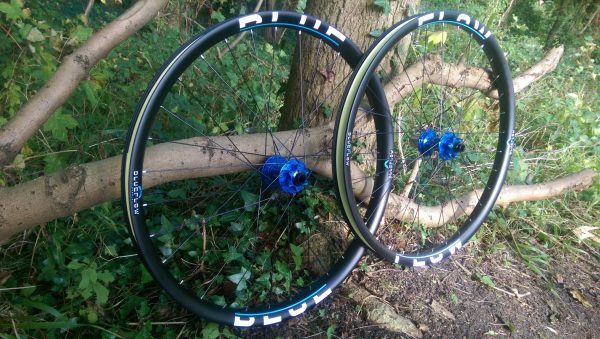 I was very happy with the service i received from the first enquiry right through to delivery and would definitely recommend the wheels and blueflow to anyone looking for a great set of carbon wheels and fantastic service. Now I want another set for my FS 29! I looked at lots of options before I came across Blue Flow. 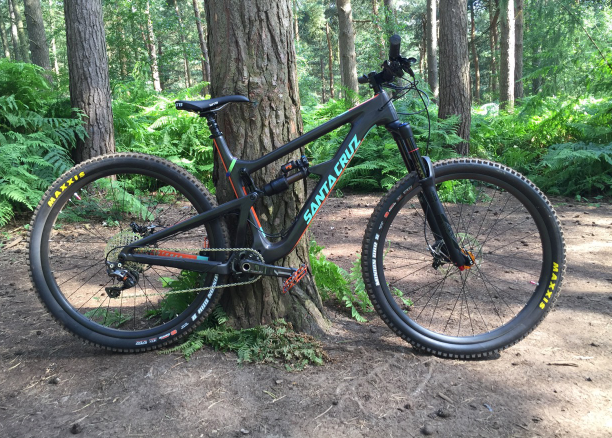 The 35mm internals were exactly what I was after for wide trail tyres and the asymmetric build on boost Hope hubs creates a really strong and laterally stiff wheel. I was slightly concerned that being so stiff would make them feel harsh but this is totally not the case, so long as you get tyre pressure and suspension setup right they feel amazing. Stuart’s wheelbuilding and service is first class. 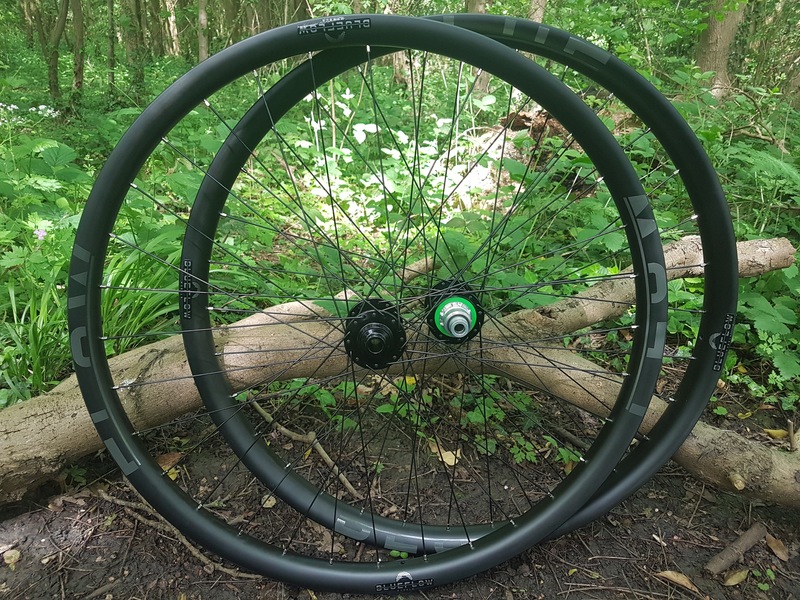 I’ve been hammering the wheels for several months including regular Bike Park Wales trips and they’ve taken everything I can throw at them with just the odd scratch. Value for money is amazing and highly recommended. 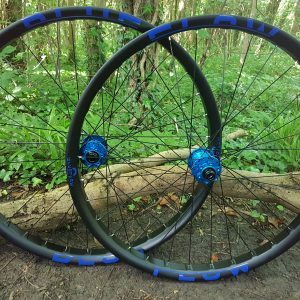 I purchased my 42mm asymmetric 29er wheels from blue flow around 6 months ago and I can honestly say I cannot fault them. I found Stuart really honest and great to deal with. If you need to ask a question he’s on it straight away with a reply by phone or email. The wheels are solid and set up great for tubeless. Just pop your tyre on with valve and sealant and your away. Bang on wheels ! Bang on Service ! 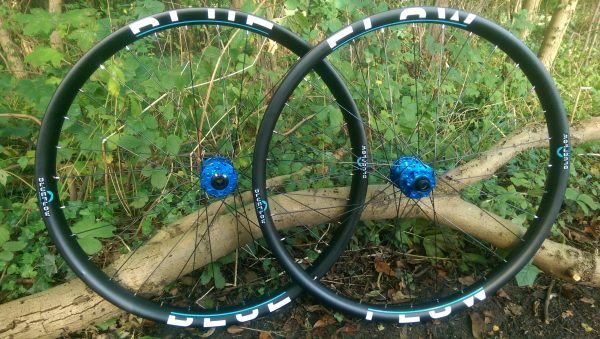 Beautiful hand built wheels, great customer service and a price so low there must be witchcraft involved!! Tyres are easy to get on an off (unlike other wide rim wheels i’ve had) and seat up to tubeless first time. Performance-wise i can’t fault them: stiff but much less tiring than the my previous wheelset, they track beautifully, give the acceleration a real snap and despite having been given quite a hammering they look and run as well today, as they did the day they arrived. Oh and the stealth grey decals look sweet. Price-wise i don’t know how they do it, because my previous factory set of carbon wheels were over 2 1/2 times the price and were made with inferior components and were a pig to get the tyres on and off of. I ordered a 27.5 35mm ID front wheel a few months back. I started with 3.0 tyres but recently swapped to a 2.8 Magic Mary, which seems to be perfect for my local single track. I haven’t noticed the wheels – which is a good thing – and would (and probably will!) buy again. 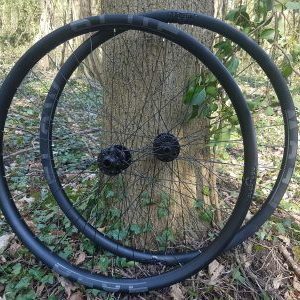 After a long time of searching and reading, i ordered a 27,5“ 42mm wheelset for my Specialized Kenevo ebike! Since the day i got them, i am enjoying them everytime i ride my Kenevo… they take a lot of beating – no worries so far! Thx a lot for the perfect support, Stuart… you have a new fan in Germany!